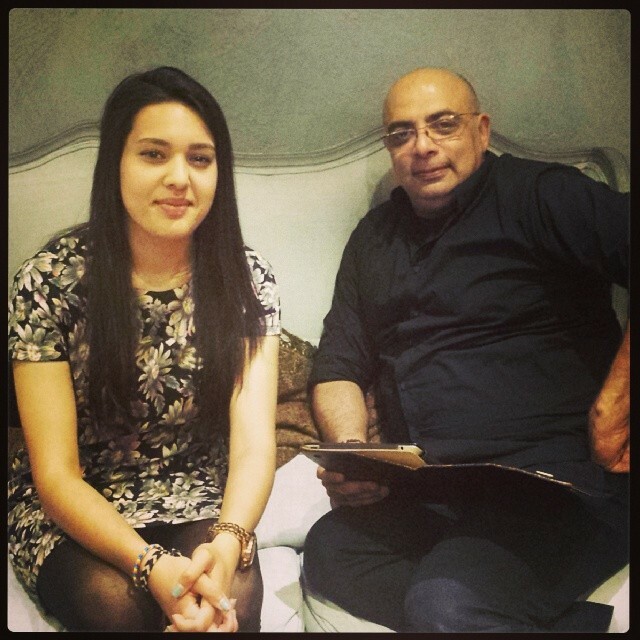 Last weekend I met the sensational Tarun Tahiliani at his AW14 collection trunk showcase at Aashni and Co (in London). His collection is gorgeous! His collection was there for a two day exclusive! and he was present for the first day. I was speechless when I met him, he is very super-cool, lovely and super- talented! Unfortunately I was not allowed to take photos of his AW14 collection in-store, however there is such a wide selection! His collection is oozing with deep colours, velvet and intricately detailed work…. you name it! 1. This Black georgette colour block saree with an ivory and grey textured palla… simple & bold. 2.Wow! This Silk Dupion zardozi gota lengha teamed with a brocade blouse and a tulle dupatta with over aari buttis in resham and zari is just shimmering with beautiful detail. 3. Finally this gorgeous to tonal blue saree is part of Tarun Tahiliana’s current SS14 collection, which unfortunately I was not able to see in-store, but the colour combo is divine and works so well with the deep coral/orange and gold border. Lovely! I have lots of other favourites…but it would end up to be a very large blog post.. so thought sticking to three would be the most sane option. Don’t forget to comment or tweet me @londonkiladki and let me know what is your favourite Tarun Tahiliani masterpiece of all time.